Just when the internet was starting to run out of articles on Jennifer Lawrence, she pulls us right back in. After the massive success of “The Hunger Games” and an Oscar win for “The Silver Linings Playbook”, Jennifer Lawrence is pretty much the most adored girl in Hollywood. With the release of “The Hunger Games: Catching Fire”, that probably won’t be changing any time soon. Picking up where its predecessor left off, Katniss (Lawrence) and Peeta (Josh Hutcherson) have returned home to District 12 as victors after surviving the 74th annual Hunger Games, a free-for-all where teenagers fight to the death. Having won by convincing the audience they would rather kill themselves than each other, the two are forced to continue a facade of young love or face the consequences from President Snow (Donald Sutherland). 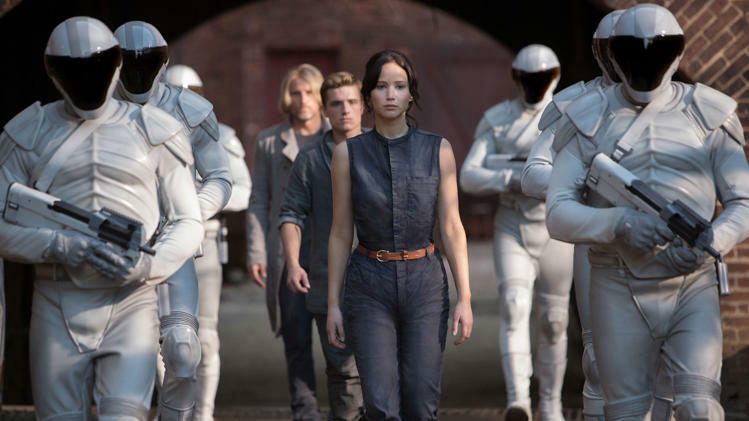 Since their rebellious act was seen as an act of defiance against a tyrannical regime, the pair are eventually forced to re-enter the Hunger Games along with 22 other past victors as part of an anniversary celebration. Most readers of Suzanne Collins’ trilogy would agree that Catching Fire is the best book of the series and, as such, provides the best material for its film adaptation to work with. While there are a couple of small things cut out for time and pacing, the film is one of the most faithful adaptations in recent memory. “Catching Fire” director Francis Lawrence does a good job fixing some of the biggest complaints from Gary Ross’ original film, the biggest of which was pacing. Granted a sequel doesn’t have to set up as much backstory as the first film of a series, but “Catching Fire” moves the story along at a pace that feels quick, but not hurried. Another positive note is that, since the Hunger Games competitors are all adults this time around, the audience is not forced to endure as much shaky camerawork to hide the violence against children. Most, if not all, of these characters are adapted well in the film, but the two who really shine are Effie and Caesar. I can imagine no one else playing these people as well as Banks and Tucci do. Effie is one of the most interesting characters in the whole series as she goes from airhead party girl to someone who has to come to terms with the injustices she smiles through every day. Of course Jennifer Lawrence has made the role of Katniss her own after two films, but these two add a lot of flavor to the story. It would be easy to compare “Catching Fire” and the rest of the books in this series to the Twilight franchise. After all they are young adult novels with a sci-fi twist and love triangles at the heart of them. However, there is a lot more to the Hunger Games series than shirtless werewolves and hilariously bad romance. This newest film feels more like a political drama than some romance novel left on a dusty shelf. Between the characters, the action sequences and the stunning visuals, there’s a little something for everyone. Improving on the original, “The Hunger Games: Catching Fire” is a film that taps into varying themes from adventure to political unrest and even science fiction to create an engaging film that can be enjoyed by almost any demographic. Ah, finally. Summer is over and we can get to the best films of the year in the fall. Wait, Thor what? Dang. One would think that “Thor: The Dark World” would have found a better home this summer amid the utter failures of “R.I.P.D.” and “The Lone Ranger”, but seeing as it’s already made $345 million worldwide against competitors like “Free Birds” and “Jackass Presents: Bad Grandpa”, Marvel is probably totally cool with it. This latest trip to Asgard picks up where “The Avengers” left off: Loki (Tom Hiddleston) is imprisoned, but the nine realms are somewhat in disarray. Just as things return to normal, an ancient enemy, Malekith (Christopher Eccleston), returns to find a weapon known as the Aether and destroy the universe. Aside from bringing in Eccleston (of “Doctor Who” fame), the sequel brings back pretty much every character from its predecessor. Yes, this means more comical abuse at the hands of Kat Dennings’ character, Darcy. I can’t be the only one feeling superhero (mainly Marvel) fatigue. Bringing the Avengers together was a great idea, but we aren’t even to “The Avengers: Age of Ultron” yet and it feels like these films are just going through the motions. Just so you don’t think I’m a total downer, though, I am anticipating the next Captain America film. I think the first one misfired too often but the character is a great one. As for this film, it suffers from a problem that it shares with the first “Thor”: the romance between Thor (Chris Hemsworth) and Jane (Natalie Portman) is one of the most forced pairings ever seen in a comic book film. Instead of chemistry, it’s just Jane fawning over the size of Thor’s arms and acting like a little kid. Another problem the film, and often Marvel, has is that villain is completely forgettable. There’s not even a single line Malekith speaks that I can recall at this moment. It’s all very generic stuff and subtitled. The bad guys in this film belong in a bad episode of Star Trek or a good episode of Mighty Morphin’ Power Rangers. The worst part being that Malekith is actually a pretty good villain in the comics. Ok, so maybe the characters are a little underdeveloped. At least the action is cool, right? Sorry, the action sequences in “Thor: The Dark World” are mostly boring. Poorly shot, poorly choreographed and too much CGI. Why should I care about Asgard under attack when everything is either too fake or shown in such an uninteresting way? There are 3 scenes that pass for decent action and they total about 2 minutes of the film. Even the final fight scene is boring, with only a barrage of humor to make it enjoyable. And, boy, is it a barrage. This film has so many jokes tucked into it that Robert Downey Jr. would tell it to slow down. Some of these jokes work quite well, but by the end of the film it gets to be too much. There’s a reason why it’s called “comic relief” and not “comic drowning”. There’s a red line of comedy you can’t cross in a film like this or else the laughs become detrimentally superfluous and steal from any tension or drama you’re trying to create. We cross it here long before the finale. The one character that saves the film from the trash bin is Hiddleston’s Loki. He is both the best source of comedy and drama in a film that is mostly forgettable. It seems his character is always the driving force behind Thor/The Avengers and, not to spoil anything, his actions have repercussions at the end of this film as well. The appearance of another Marvel hero in the film is also one of its biggest highlights. 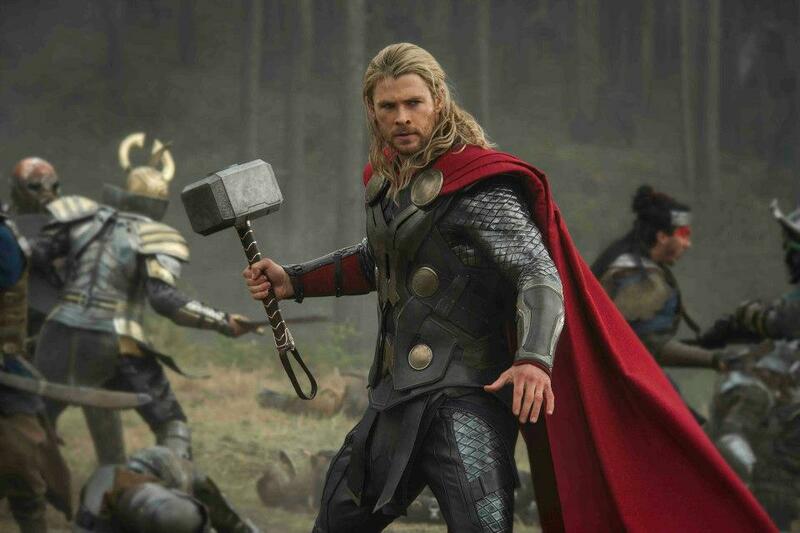 “Thor: The Dark World” is enjoyable at times, but overall feels like another missed opportunity for Marvel. As always with these movies, be sure to stay through the credits for a bonus scene. For the last few years I have felt that Chiwetel Ejiofor was one of the most underrated actors in Hollywood. With convincing roles in films like “Children of Men”, “Serenity”, and “Redbelt”, it’s been a long time coming for him to get some recognition. Throw in some great reviews coming out for “12 Years a Slave” earlier this year and it would be fair to say I was more than excited. Ejiofor plays the true-life character Solomon Northup, a talented violinist from New York who is kidnapped and sold into slavery. A story that is almost impossible to believe today, Northup was lured with a promising business opportunity and then betrayed, leaving him a slave in Louisiana for 12 years. No doubt some people hear the subject matter of “12 Years a Slave” and think “Do we really need to go there again?” It’s not a ridiculous question, but I believe the American system of slavery was so dramatic, widespread and alarming that there are still many untapped stories to tell from it. If we can have a million cop movies that all run together, a few of these every now and then should be fine. What makes this film stick out from almost every other of its kind is that the majority of its characters are unique. Throughout his time in the South, Northup works for several different masters, no two of which are quite alike. Ford (Benedict Cumberbatch) is a gentleman who takes care of his slaves about as well as one can in such a system. Judge Turner (Bryan Batt) is more strict, but a fair man who allows Northup to earn a wage as a violinist. Then you have Michael Fassbender’s Mr. Epps who is the stereotypically evil (but plenty memorable) master who Northup spends most of his time under. Though each of the characters involved with the slave trade have at least some blame for Northup’s plight, they have their own personalities and prejudices. The slaves are a little more on the generic side with one notable exception: Patsey (Lupita Nyong’o). Patsey is a young female slave who has the misfortune of being her master’s favorite toy. Some of the film’s most brutal moments are interactions between her and Fassbender’s Mr. Epps. Despite being her first feature film role, Nyong’o makes a strong case for Best Supporting Actress. I also wouldn’t be surprised to find Ejiofor and Fassbender on an Oscar ballot next year. Something that really breathes authenticity into the film is the way the dialogue is written. Instead of falling into the same old slurring of words that every film about this time period likes to place on the English language, John Ridley’s script calls for more thoughtful expression and savory word choice. Director Steve McQueen captures the brutality of the slave trade with an unflinching eye throughout the film. The first time we see Northup beaten in chains, the camera is motionless while a man literally breaks his paddle on Northup’s back. Another time he is strung up from a tree with only the tips of his toes keeping him from asphyxiation and the camera simply gazes from afar. Though it hides none of slavery’s evil, “12 Years a Slave” never goes into the borderline parody of films like “Django Unchained”. There are only two criticisms of “12 Years a Slave”, neither of which hurt the film irreparably. First, the film doesn’t handle the fear of the situation as well as it could. There are two scenes in the film where Northup is being chased or threatened by one of his masters and there is little to no suspense. In fact, he is being chased around the Epps home by a knife-wielding Fassbender and the scene is mostly played for laughs as Epps slips or trips over his own feet. Northup’s situation is incredibly frightening but the film doesn’t do its best to capitalize on this emotion at times. Secondly, almost no one ages over the course of 12 years. If you didn’t know the title of the film, you would probably think the protagonist spent 3-5 years a slave. The passage of time is not particularly felt by anyone except for a couple strands of gray hair on Ejiofor’s head at the end of the film. This is actually a film that could have used another 15 minutes to help convey the length of its story. “12 Years a Slave” is carefully and beautifully shot with outstanding performances and great characters. It is easily one of the year’s best films. While the horrors of the African American slave trade were horrible, I would like to point out that slavery is not just a thing of the past. There are currently more slaves in the world today than at any point in human history. If you would like more information on human trafficking or slave labor, the people at International Justice Mission are a good resource. You can also take a survey to find out how many slaves currently work for you around the world. It’s pretty eye-opening.